Many barriers to accessing evidence-based treatment for substance use disorder (SUD), particularly medication assisted treatment, are related to the workforce. Barriers include workforce shortages for certain providers, insufficient training, education and experience, lack of institutional and clinician peer support, provider stigma and inadequate or burdensome reimbursement. Recognizing the importance of the SUD workforce in providing treatment, several questions were added to the National Survey of Substance Abuse Treatment Services in 2016. The new survey responses allow us to identify the number of practitioners in the SUD workforce, their professional training, certification, and the ratios of professionals to clients in SUD treatment. This data may help support improved quality and access to care through better understanding of specific staffing need. Improving the quality and capacity of prevention and treatment programs for substance use disorders (SUDs) is of vital importance to the nation's health. Approximately 21 million people aged 12 or older had a SUD related to their use of alcohol or illicit drug use in 2016 that caused significant impairment and failure to meet major responsibilities at work, school or home or received treatment for an SUD (SAMHSA, 2017). However, only 10.6%, or about 2 million people who met these criteria received specialized treatment that year (SAMHSA, 2017).Despite federal policies enacted within the last decade aimed at promoting insurance coverage for SUDs, the existing SUD treatment workforce may be insufficient to accommodate the potential increase in demand for care and other factors may be contributing to stagnant treatment utilization rates. Many barriers to accessing evidence-based treatment for substance use disorder (SUD), particularly medication assisted treatment, are related to the workforce. Barriers include workforce shortages for certain providers, insufficient training, education and experience, lack of institutional and clinician peer support, provider stigma and inadequate or burdensome reimbursement (Haffajee et al., 2018). Recognizing the importance of the SUD workforce in providing treatment, several questions were added to the National Survey of Substance Abuse Treatment Services (N-SSATS) in 2016. The new survey responses allow us to identify the number of practitioners in the SUD workforce, their professional training, certification, and the ratios of professionals to clients in SUD treatment. These data may help support improved quality and access to care through better understanding of specific staffing needs. The SUD treatment workforce comprises counselors, medical professionals, and support staff. 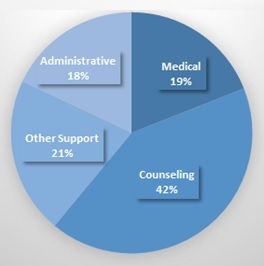 The 2016 N-SSATS survey found 197,559 full-time equivalent (FTE)1 paid staff and 6,726 unpaid staff in specialty SUD treatment facilities in 2016.2 About two-fifths of the FTE paid staff were counseling staff (that is, no-degree or degreed counselors); the other three-fifths were about evenly divided between medical staff (that is, physicians, nurses, pharmacists, and mid-level professionals), other support staff (that is, peer support staff, care managers, care navigators, other recovery support staff, other clinical staff and interns, pharmacy assistants, contractors/per diem staff, and intake coordinators), and administrative staff (see Figure 1). The level of education among SUD treatment counseling staff varies widely. A substantial majority of counseling staff FTEs (57%) had a graduate degree, but most counseling staff members with a graduate education were not certified in addiction treatment (60%). Although counseling staff in SUD treatment facilities have high rates of postgraduate education, this advanced education may not translate into greater knowledge specific to SUD treatment, as many graduate programs in social work and psychology do not provide specialized training in SUDs. Community colleges provide much of the specialized academic training in SUDs (McCarty, 2002; IOM, 2006). Certification in addiction treatment was more common among counselors with less educational attainment. Staff to client ratios vary greatly across facilities. 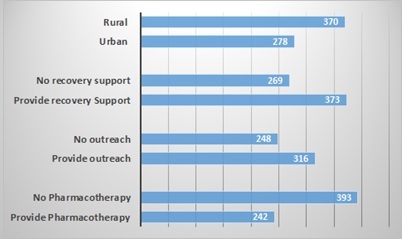 Staff hours per 100 outpatient clients per week differed by services offered, availability of pharmacotherapy, urbanicity, operation type, and facility size (see Figure 2). The data highlight the overall distribution of professionals in the SUD treatment workforce, and the high variability in client-to-staff ratios. This information can inform workforce policies to improve treatment quality and capacity across the country. Some of the differences in staff to client ratios may be due to differences in clinic activities and community characteristics (for example, whether the clinic provides outreach, or operates in a rural area), but some may also be due to the organization of the workforce. While these data may provide guidance into approximate numbers and types of staff that may be required to meet current needs per client, more work is needed to discern whether current workforce configurations maximize the ability of professionals to treat clients. For example, Vermont's "Hub and Spoke" model has been shown to increase SUD treatment capacity in the case of opioid use disorder (Brooklyn & Sigmund, 2017), by creating specialized clinics that provide consultation and support to a network of primary care providers, thereby extending the capacity of medical specialists to treat patients. Within its own specialized SUD treatment programs, the U.S. Department of Veterans Affairs has examined staffing mixes that maximize patient outcomes at lowest cost and found that in residential and intensive outpatient programs staffing mixes could be improved by increasing the use of nurse practitioners (Im et al., 2015). Future studies should further identify which models of care best utilize the SUD treatment workforce and allow for better outcomes for patients, utilizing the information on the current configuration and supply of workers. This may help further inform national workforce projections, currently prepared by the Health Resources and Services Administration (HRSA, 2016). Baser, O., Chalk, M., Fiellin, D.A., & Gastfriend, D.R. (2011). Cost and utilization outcomes of opioid-dependence treatments. American Journal of Managed Care, 17, S235-48. Brooklyn, J.R., & Sigmon, S.C. (2017). Vermont hub-and-spoke model of care for opioid use disorder: Development, implementation, and impact. Journal of Addiction Medicine, 11(4), 286. Haffajee, R.L., Bohnert, A.S., & Lagisetty, P. (2018). Policy pathways to address provider workforce barriers to buprenorphine treatment. American Journal of Preventive Medicine, 54(6S3):S230-S242. Health Resources and Services Administration (HRSA) & Substance Abuse and Mental Health Services Administration (SAMHSA). (2015). National Projections of Supply and Demand for Behavioral Health Practitioners: 2013-2025. Rockville, MD. Im, J., Schachter, R., Finney, J., & Trafton, J. (2015). Toward cost-effective staffing mixes for Veterans Affairs substance use disorder treatment programs. BMC Health Services Research, 15, 515. Institute of Medicine (IOM). (2006). Improving the Quality of Care for Mental and Substance-Use Conditions. Washington, DC: National Academic Press. Jones, C.M., Campopiano, M., Baldwin, G., & McCance-Katz, E. (2015). National and state treatment need and capacity for opioid agonist medication-assisted treatment. American Journal of Public Health, 105(8), e55-e63. Managed Care and Treatment Services - Medicaid Redesign Team. Retrieved June 19, 2018, from https://oasas.ny.gov/ManCare/MRT.cfm. Mann, C., Frieden, T., Hyde, P.S., Volkow, N.D., & Koob, G.F. (2014). Medication Assisted Treatment for Substance Use Disorders [Informational Bulletin]. Retrieved June 19, 2018, from https://www.medicaid.gov/Federal-Policy-Guidance/Downloads/CIB-07-11-2014.pdf. McCarty, D. (2002). The Alcohol and Drug Abuse Treatment Workforce. Frontlines: Linking Alcohol Services Research & Practice, 5(8), 2. Stoller, K.B., Ann, M.C., & Schorr, A. (2016). Integrated Service Delivery Models for Opioid Treatment Programs in an Era of Increasing Opioid Addiction, Health Reform, and Parity. Retrieved June 19, 2018, from http://www.aatod.org/wp-content/uploads/2016/07/2nd-Whitepaper-.pdf. Substance Abuse and Mental Health Services Administration (SAMHSA). (2016). National Survey of Substance Abuse Treatment Services (N-SSATS): 2016. Rockville, MD: SAMHSA, 2016. SAMHSA. (2017). Key Substance Use and Mental Health Indicators in the United States: Results from the 2016 National Survey on Drug Use and Health (HHS Publication No. SMA 17-5044, NSDUH Series H-52). Rockville, MD: Center for Behavioral Health Statistics and Quality, SAMHSA. Retrieved June 19, 2018, from https://www.samhsa.gov/data/report/key-substance-use-and-mental-health-indicators-united-states-results-2016-national-survey. SAMHSA. (2017). FY 2018 Certified Community Behavioral Health Clinic Expansion Grants. Rockville, MD: Center for Behavioral Health Statistics and Quality, SAMHSA. Retrieved June 19, 2018, from https://www.samhsa.gov/grants/grant-announcements/sm-18-019. We define an FTE as 40 working hours per week. N-SSATS surveys the universe of specialty SUD treatment facilities. In 2016, the survey had a 91% response rate. Estimate are not adjusted for facility or item non-response. This Issue Brief was prepared by Ellen Bouchery (Mathematica Policy Research) and Judith Dey (U.S. Department of Health and Human Services). The authors gratefully acknowledge the assistance of Eitan Armon and Daniel Schwartz in preparing this issue brief. This brief was based upon intramural research by the U.S. Department of Health and Human Services, Office of the Assistant Secretary for Planning and Evaluation, Office of Disability, Aging and Long-Term Care Policy (DALTCP). Additional research was also done under contract #HHSP23320100019WI between DALTCP and Mathematica Policy Research. For additional information about this subject, you can visit the DALTCP home page at http://aspe.hhs.gov/office-disability-aging-and-long-term-care-policy-daltcp or contact the ASPE Project Officer, Judith Dey, at HHS/ASPE/DALTCP, Room 424E, H.H. Humphrey Building, 200 Independence Avenue, S.W., Washington, D.C. 20201. Her e-mail addresses is: Judith.Dey@hhs.gov.